Cemeteries are synonymous with lush, green and well-watered lawns - even in drought-ridden Southern California. But the state's first mandatory water restrictions are starting to have an effect on all that green. 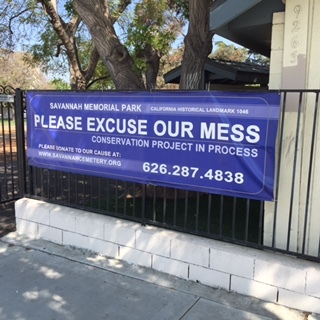 Rosemead's Pioneer Cemetery in Savannah Memorial Park is experiencing the challenge of cutting down on water firsthand. Savannah Memorial Park board member Beverly Morten is on a mission to save water by bringing drought-tolerant landscaping to the cemetery. It's currently in transition, and it looks bad. "It looks like a bomb went off!" Morten said, while pointing at a ten-foot high pile of mulch in the driveway and at weeds sprouting between the headstones. Half of this cemetery has been dug up. The grass is gone. "We will plant native plants that don't require water once they are established, people can come and enjoy something visually." She said the park will have dry creek bed, planted with lavender, rosemary, thyme, and lamb's ears. "Things the native Indians would have been using for medicinal purposes." 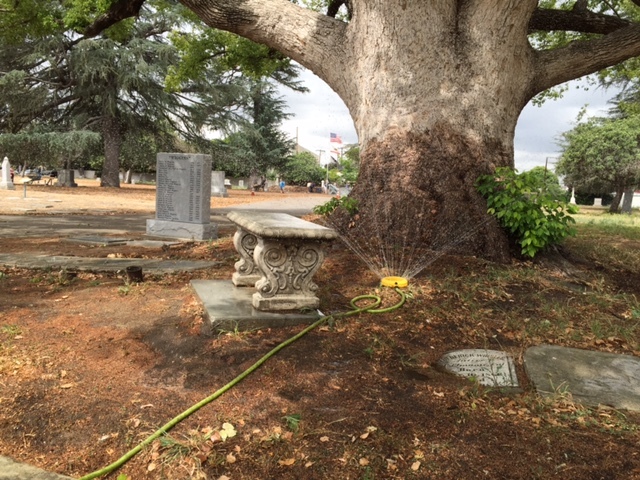 Only the trees on the cemetery still get water - once a week, by hand with a hose. "We knew we were in a historic drought and asked ourselves what we were going to do to be socially responsible to keep our water bill down as well as the lawn maintenance. We decided to leave the water off figuring out how we could re-landscape for water conservation," said Morton. This might be the beginning of the end for lush lawns like the ones European landscape architects brought to the United States early in the 20 th century, like the green expanse of the iconic Forest Lawn Memorial Park. Forest Lawn created the prototype of almost every cemetery created in the United States in the 20 th century according to David Sloane author of "The Last Great Necessity: Cemeteries in American History." Sloane said the cemetery is a "powerful and brilliant idea, democratic, an equalizer between rich and poor." "On the lawn you don't have to compete with your neighbors. Everybody gets the same headstone and the same grass around it," he said. Another reason to have so much lush greenery was that it signaled life. Forest Lawn founder, Hubert Eaton, wanted as few signs of death at the cemetery as possible. "He wanted it more park like, death is to be obscured," said Sloane. "We're going to celebrate family, nation and community. The lawn becomes the backdrop for that civic space that they create." But back then, water wasn't the problematic issue it is today; no one was cutting back on showers or wondering when, if ever, it would rain again. And even though it makes sense from an environmental standpoint, not everybody is happy about the changes at Rosemead. "To see this, it just makes me mad," said Janice Wiggins White, whose ancestors are buried under the biggest tree in the middle of Savannah Memorial Park. We should have somebody come and take care of this. Looking at the cemetery looking like this with all these weeds, it just makes me want to cry,"
Wiggins White remembers the cemetery as beautiful oasis, where she could sit and looking at the lawn and the headstones. The 77-year-old sometimes brings her own garden hose to water the tree. "They keep saying it's 150 years old and will be ok. It still needs stuff. It's not that colorful. To me it looks like: feed me, feed me!" The cemetery board relies mostly on volunteer work, which makes the landscaping a slow process. However, Morten is determined to make Savannah Memorial Park the new prototype for California cemeteries. "I see medicinal herbs, Manzanita, and all our plants will only need ten inches of rain or less per year," said Morten. "As our governor Jerry Brown says: Grass - get over it!"